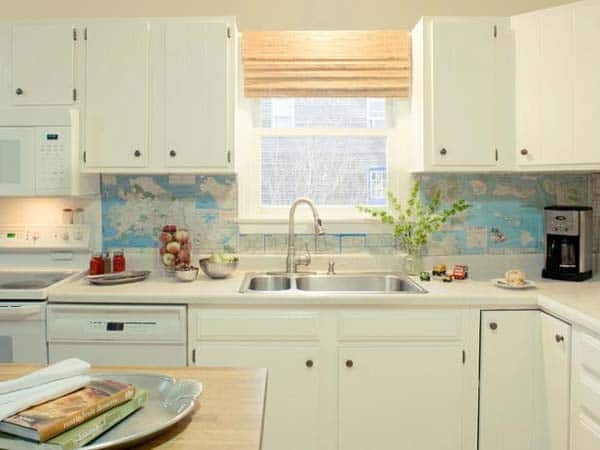 if you’re the kind of person who spends a lot of time in your kitchen, whether that be because you’re an avid cook or you just live in the kind of house where that’s the central traffic hub for the family, then you might be like us in that you notice your backsplash more than the average person. We recently decided that ours isn’t nearly as unique and creative as it could be, so we’ve set out to find crafty ways to redo it and give it a new lease on life with our very own handy home and crafting skills. Just in case you’re as enamoured as we were in the idea of making your home a brand new kitchen backsplash as we were, if not more, here are 15 of the very best ideas, designs, and tutorials that we’ve come across so far in our search for inspiration and guidance! Have you taken care over the years to establish a sort of rustic chic or overtly reclaimed and repurposed aesthetic throughout your home over the years and now you’re slowly trying to match outstanding details to that style in smaller projects? Well, if you haven’t made it as far as your backsplash yet, we’d definitely suggest taking a look at how Circa Dee used repurposed pieces from wooden pallets to make theirs! Are you very interested indeed in making a lovely, clearly homemade backsplash throughout your kitchen but you’re prefer something with a bit of texture and colour to it? 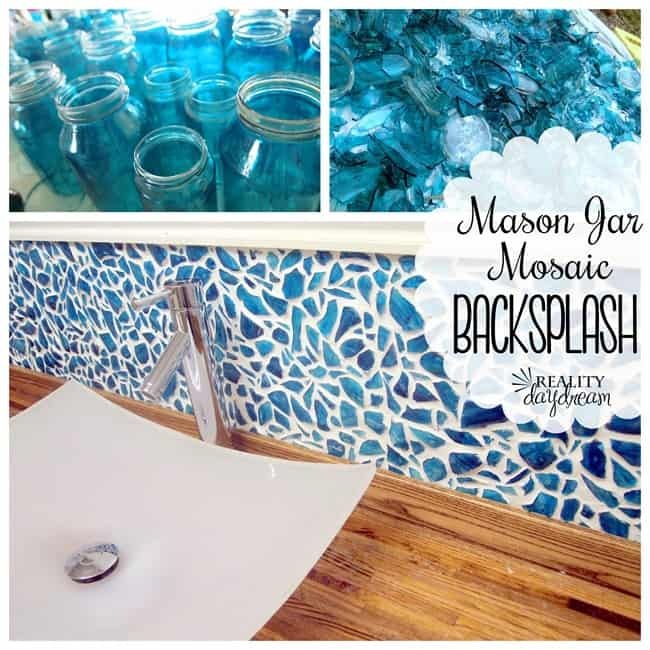 Well, if the kinds of mosaic art pieces you might see in seaside homes have any appeal to you, we think you’ll adore the way Reality Daydream pieced this lovely backsplash together from smashed blue mason jars! Be sure you wear gloves at all times so you don’t cut yourself on the glass edges. 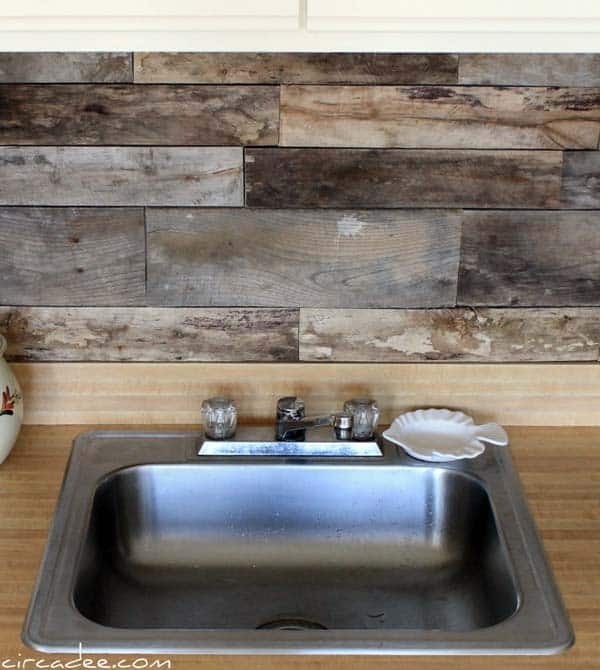 Are you absolutely interested in a sort of old fashioned aesthetic in making your new backsplash but you’re just not sure going as rustic as reclaimed pallet wood is quite what you had in mind? Then perhaps you’d prefer to see how Stilettos and Diapers created this lovely, traditional looking piece from long decor stones layered together almost like a stone wall. 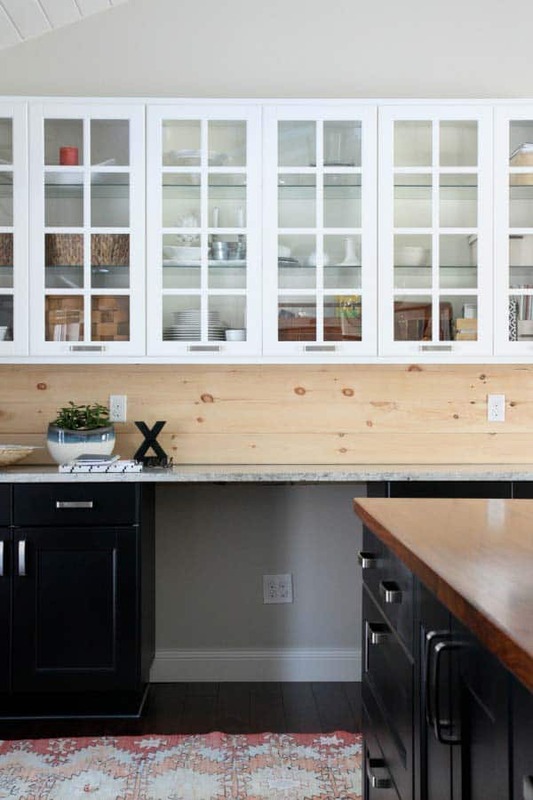 Just because you’re interested in making yourself a wooden backsplash doesn’t mean you have to choose a worn and weathered look or use upcycled, rustic pieces! Instead, consider the smoothed and fresh look of this newer wooden plank backsplash project outlined step by step on House Tweaking. They show you how to sand it to perfection and you might choose to stain and seal it or leave it as natural looking as possible. Have you always loved the way fresh, gleamingly clean tiled backsplashes look in a pristine new kitchen but you’re just not sure you’re actually up to installing the tiles yourself in a place that you might not live in forever? Perhaps that project is a little too pricy and you’re looking for a similar aesthetic from a more affordable option. 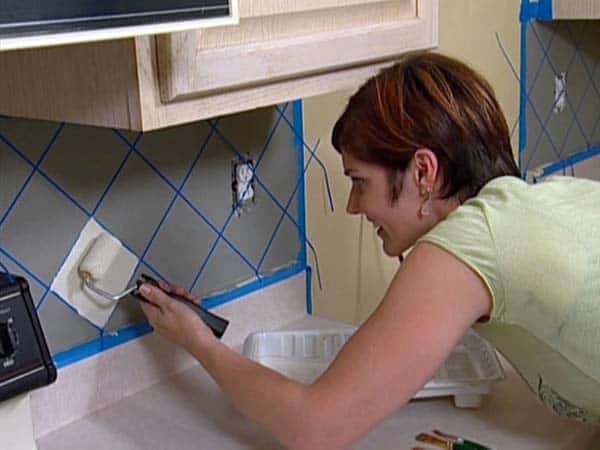 In that case, we think you’ll get a real kick out of the way DIY Network painted their backsplash to look like tile instead! This leaves a flat surface for cleaning but still gives that pattern and visual texture. 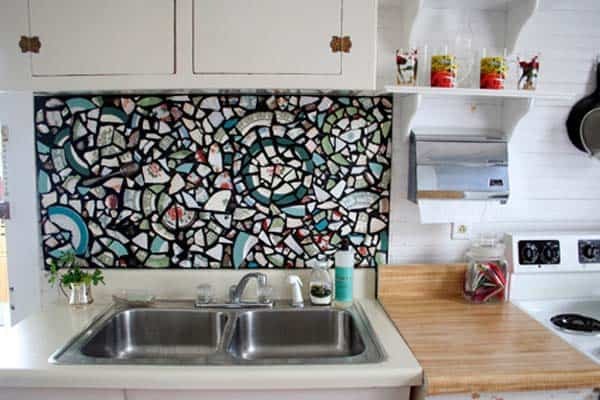 Were you very intrigued indeed by the concept of making a mosaic style backsplash from smashed pieces of upcycled things but you’re not sure a singular colour of glass quite has the level of eclectic you’re really going for? Then maybe you’d prefer to try your hand at something like this multi-coloured smashed china mosaic backsplash outlined step by step on Design Sponge! We’ve always loved the way that working with a smooth, grey concrete gives a room a feeling that’s natural but a little bit urban too. Just because we like the neutral appearance of the shade, however, doesn’t meant we don’t want a bit of visual interest! 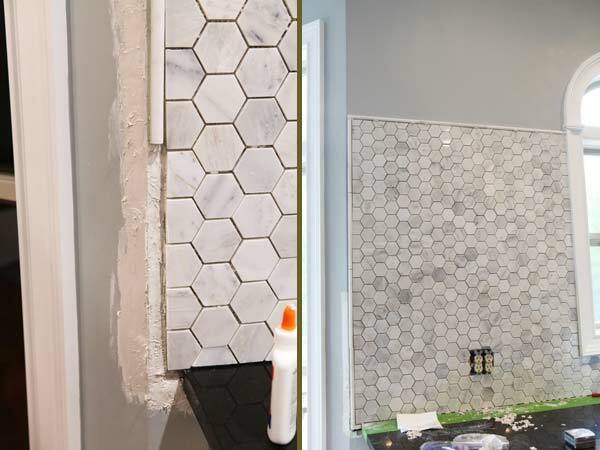 We’re actually quite fond of the way Bower Power chose to shape their DIY concrete tiles hexagonally and fit them together on their backsplash like a honeycomb. 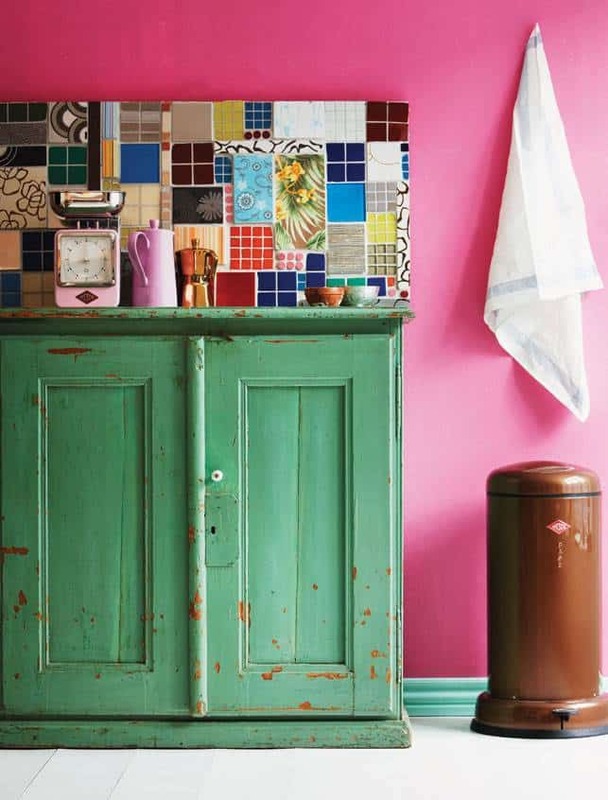 Maybe you’re not completely opposed to the idea of having a simple tiled backsplash but you’re really hoping to have some kind of colourful, patterned, and visual detail added to your kitchen for some personality at the same time? Then instead of just buying plain tiles from the store, we’d suggest taking a look at how Alt. collected all kinds of reclaimed, repurposed, and leftover tiles and and turned those into a stunningly attention grabbing, patchwork inspired backsplash instead! Were you pretty intrigued indeed by the idea of making a backsplash out of layered stone like we showed you a little earlier on our list but you’re just not sure that the straight, brick lay aesthetic will quite suit the rest of your kitchen’s scheme? Then maybe you’d prefer to work with smooth, rounded river stones instead! 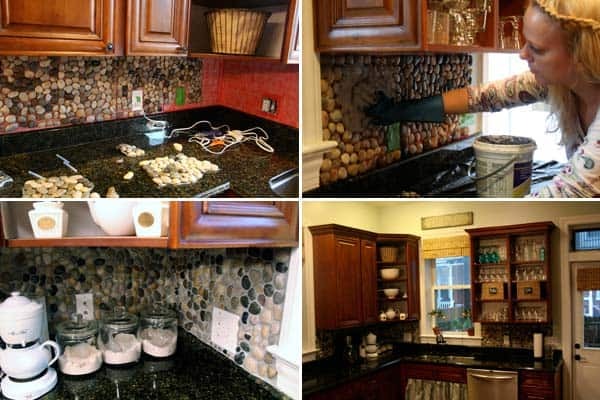 We love the way Home Stories A to Z made this DIY cobblestone inspired backsplash that looks like pebbles in a river bed. Perhaps you’re actually a lot less concerned with the idea of including physical texture in the materials you use for your backsplash because you’d rather concentrate on awesome pattern and visual texture instead? In that case, we’d suggest starting a search for a wallpaper you completely adore and taking a good look at how Family Handyman made over their backsplash using their favourite wallpaper! 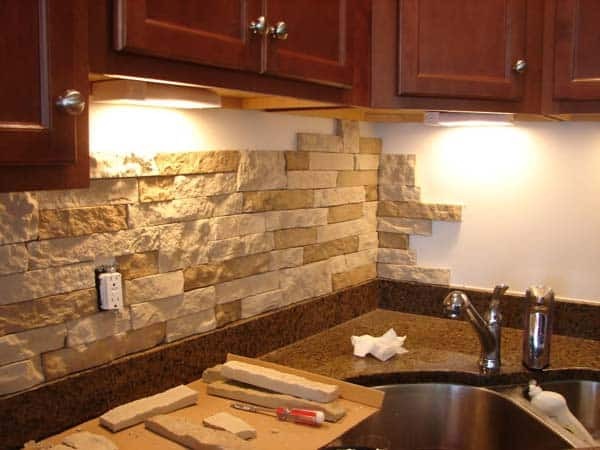 Perhaps you’re feeling quite interested in the entire concept of creating a backsplash out of something upcycled or reclaimed but you just haven’t quite seen the idea that convinces you on one material over another yet? In that case, we’d like to present another unique idea for your consideration! 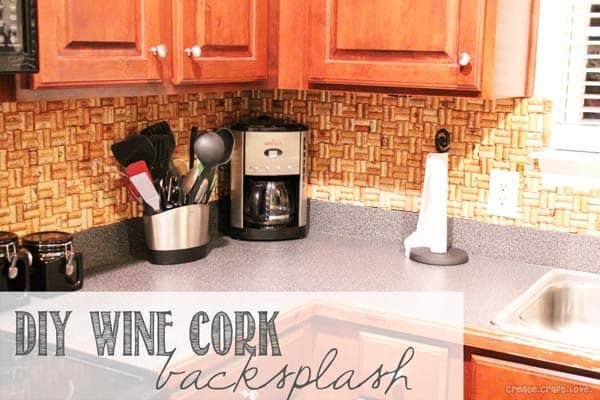 If you’re a wine enthusiast who’s known in your friend group for always having the best tasting years on hand, take a look at how Create, Craft, Love made their backsplash over by creating an alternating pattern using a large collection of saved wine corks. Are you actually still finding yourself scrolling through our ideas but thinking most about the mosaic concepts we’ve already shown you, even though none have quite held your attention entirely? Then here’s an alternative that just might! 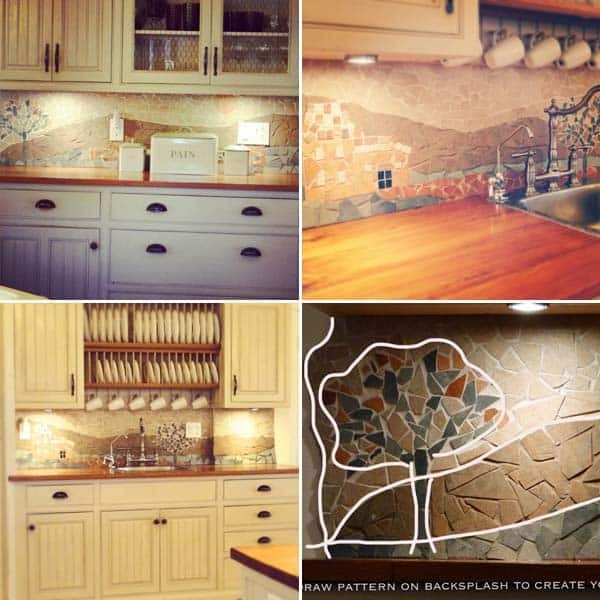 We’re in love with the way Lynne Knowlton outlines not only the process of making a mosaic tiled backsplash, but also how they designed theirs to look like a tree and rolling hills in the countryside! Have you actually been scrolling through our list hoping to find something a little more explicitly modernized or contemporarily industrial looking but nothing has quite jumped out at you yet? 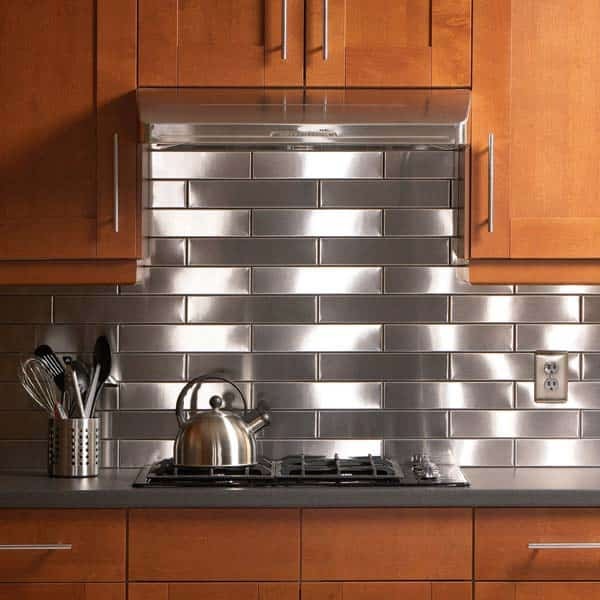 Then perhaps you’d prefer this much more metallic backsplash project outlined on Family Handyman! They show you how to make a brick lay pattern similar to the stones you saw earlier, but this time with shining silver steel. Were you actually quite intrigued indeed by the idea of simply wallpapering your backsplash but you’re just not sure that you’ll find a regular wallpaper that has the kind of unique and upcycled or creative character you’re looking for? Well, world travellers and those with wanderlust rejoice, because we think DIY Network might just have the perfect idea for you! Check out how they used similar techniques but this time using repurposed world maps. Are you actually the kind of person who loves customizable decor details because you’re always changing your mind and wishing you could switch things up on a pretty frequent basis in your home? 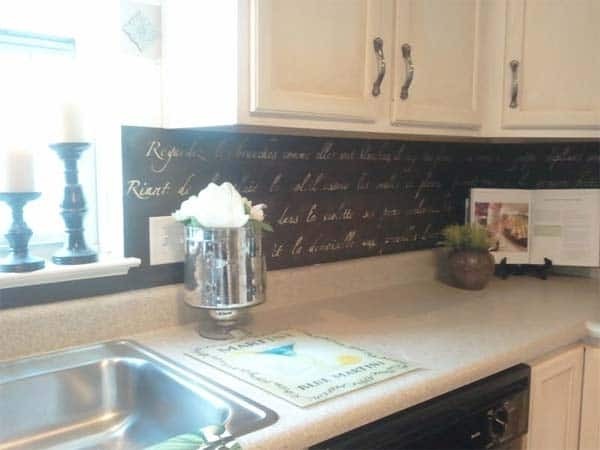 Well, if you don’t mind dark colours, then we’d definitely suggest taking a look at how Snazzy Little Thing re-did their backsplash using chalkboard paint so they could write and change quotes, drawings, and details whenever they please. You might even write your shopping list or reminders for your family there! Do you know a fellow DIY enthusiast who is intent on overhauling their own kitchen backsplash but who could probably use some guidance or inspiration along the way? Share this post with them so they have all kinds of help before they get started!